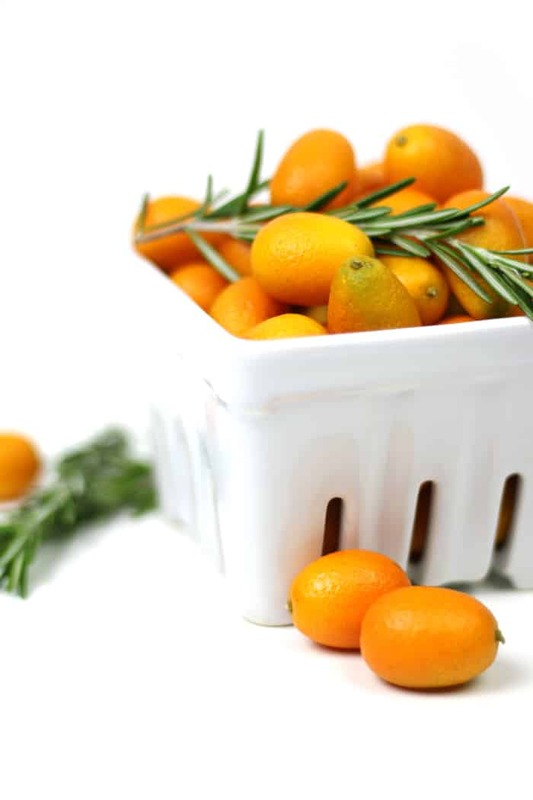 Pick up some pearly kumquats, cut some fresh rosemary and combine for a totally new way to appreciate winter citrus. 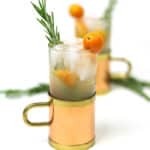 The Rosemary Kumquat Moscow Mule is a bright and refreshing variation on everyone’s favorite cocktail with vodka and ginger beer. Copper mug optional, but totally encouraged. Right after the holidays, I made a last-minute trip to the grocery store to get, like, three things. 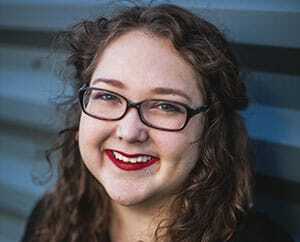 You know, those inevitable things that are mentally on your list — but not on your actual list — and always escape you in the moment? I really despise those kinds of trips to the grocery store. If only I had just remembered to get those few things in the first place! But this time, I spied some gems. Gems in the form of kumquats, that is. I’ve tried kumquat juices in cocktails at bars and in marmalade. But somehow I had never eaten the fruit! I brought home two pints and dared myself to eat them. Bravery in its finest. These tiny citrus fruits have a sweet peel that you can eat. (Plus, they’re so small, you wouldn’t really want to peel them!) The juice, pulp and seeds inside are much more tart, even bitter sometimes. Together, they make for a sweet and sour citrus fruit that’s fun to eat. I thought they would be ultra delicious in a Moscow mule. 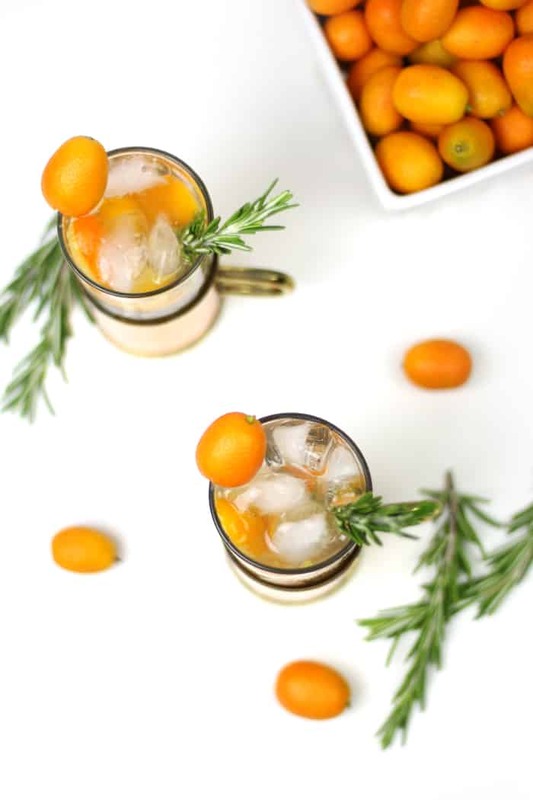 For this Rosemary Kumquat Moscow Mule, I started with a rosemary-infused simple syrup. 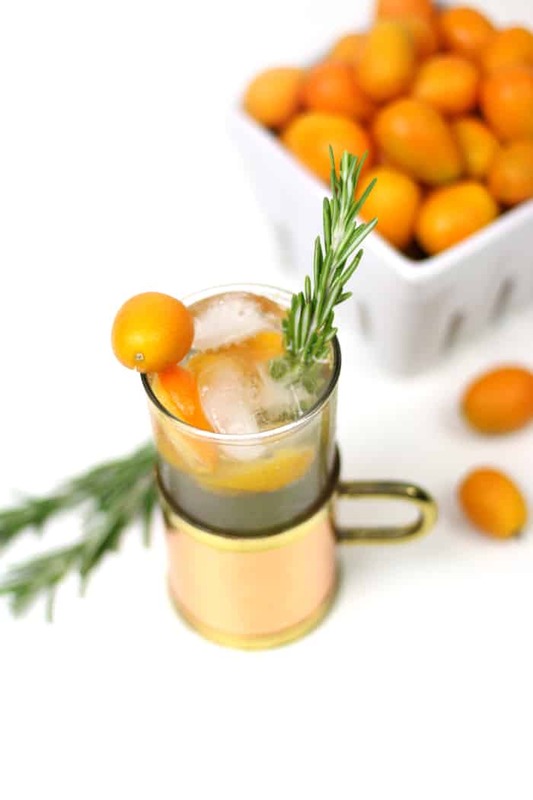 Rosemary and citrus go well together, and a kumquat pairing is no different. Then, I poured some of the rosemary simple syrup into a glass and muddled it with kumquat halves and vodka. This helps the kumquat skin to release its sweetness and forces some of the juices out, too. 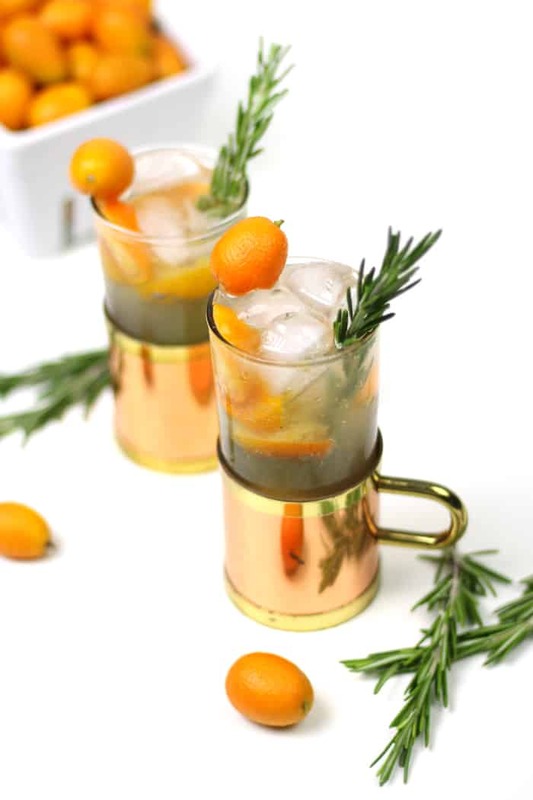 Moscow mules usually contain lime, but here the kumquat works just as well. Lastly, I topped the drinks with my favorite non-alcoholic ginger beer. I garnished them with more kumquats and sprigs of fragrant rosemary. By the way, aren’t those glasses amazing? I’m in love. I picked them up at an antique store when I visited Phoenix last year and I have been saving them for just the right cocktail! Thankfully the Internet has some similar glass and copper mugs that are just as cute. So, if you spy kumquats on your next grocery trip, pick some up! Try these little gems in your next cocktail. Eat them whole. Cut them up and put them in your salads. (Trying that next.) Be brave, friends. In a small saucepan on medium heat, combine sugar, water and rosemary sprigs. Stir until sugar dissolves. Bring to a simmer and remove from heat. Let cool completely. Store in a glass jar for up to 1 month. 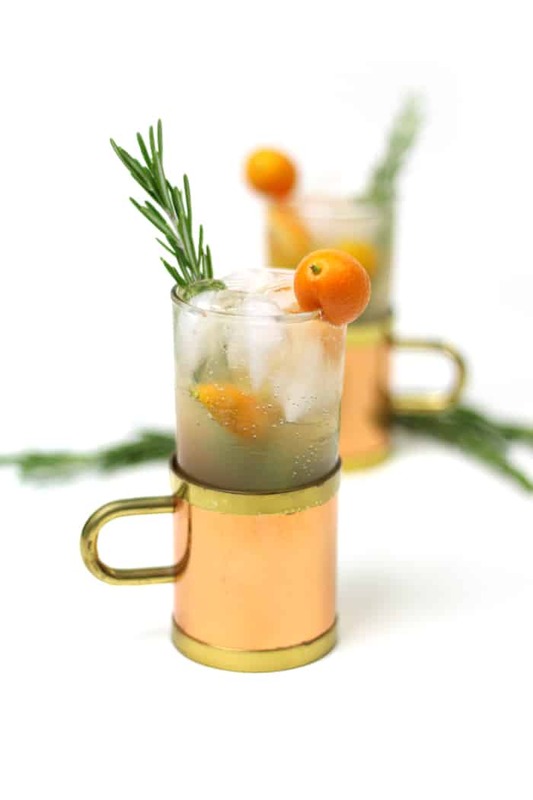 In two copper mule mugs or highball glasses, add rosemary simple syrup, vodka and 3 kumquat halves. Muddle the kumquats, mashing and squishing them so the juices and skins infuse their flavor into the vodka and syrup. Fill the glass completely with ice. Top with ginger beer. 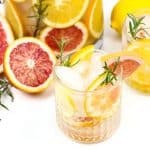 Garnish with a rosemary spring and a kumquat on the rim of the mug. Also, it’s 4 o’clock on a Friday afternoon, and I wish I had one of these in hand because they sound INSANELY tasty! Cheers to the weekend, friend! This looks SO good! 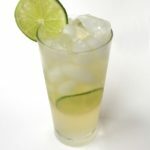 I love moscow mules but you might have made me love them more now! Kumquats: love. Rosemary: love. 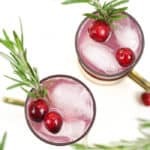 Beautiful and tasty cocktails: love! This cocktail is just want I need. It’s such a pretty mule and I bet it tastes amazing! This cocktail is calling my name!! It looks and sounds fantastic!! What a fun way to use kumquats! Looks and sounds refreshing and fun. 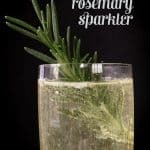 Love the idea of the rosemary simple syrup! Such a great addition! I have to be honest and say I’ve never had a kumquat! This looks like the perfect reason to try them though!